If you’re afraid of going to the dentist because of the potential costs you could incur, odds are you don’t have dental insurance – or the right dental insurance. If you’re wondering whether or not dental insurance is right for you and your family, we have some helpful information that could make the decision a little easier. Unlike health, auto, and homeowner’s insurance, dental insurance isn’t quite as much of a must-have. That isn’t to say, however, that visiting the dentist isn’t worthwhile – quite the opposite, really – but rather, you may not be getting the value you’d imagine from dental insurance. First off, not all dental insurance premiums are created equal. In fact, many Americans forego dental coverage altogether because their employer doesn’t offer a reduced or subsidized group-rate dental insurance. For many, paying more than 20 to 30 dollars per month for dental insurance isn’t worth the coverage they’d receive, even if it is through work. Other plans, like AARP for instance, offer group rates to qualifying individuals regardless of work eligibility. 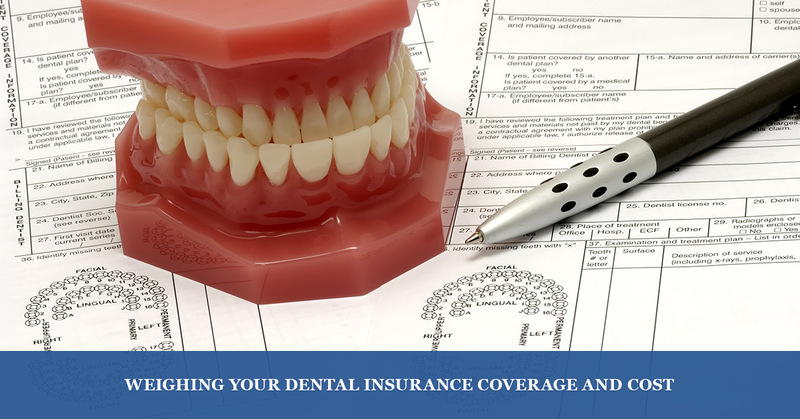 For those individuals that do not wish to use (or aren’t offered) employer group coverage or an otherwise obtained group rate, dental insurance can become expensive quickly. It is also worth noting that not all dental insurances operate exactly the same. Just like with health insurance, there are a few primary types of insurance that summarizes the coverage of most plans. The basic types of insurance are indemnity, PPO, and HMO, which operate very similarly to their health insurance counterparts. Regardless of the specific type of coverage, most plans offer a 100-80-50 level of coverage, with the plan covering 100 percent of routine exam costs (cleaning, screening, even x-rays), 80 percent of routine preventive maintenance (fillings, etc), and up to or around 50 percent coverage on major dental procedures (root canals, crowns, etc). In this way, it is important to factor in the needs you may have at the dentist and then determine what, if any, need you have for the coverage offered. While the 100-80-50 rule seems great, it is important to remember that most plans come with a per person deductible on coverage, which is typically around 50 dollars. This means to get the coverage on 100 percent of your preventive care, you’ll still have to pay 50 dollars one time per person on your plan (or whatever your deductible is). With an average initial exam cost averaging about 85 dollars, if you only attend the dentist once per year, then your are unlikely to get your money’s worth out of anything but a free plan. Another major gripe that people have with their coverage is the plan maximum, which can come in the form of annual or lifetime plan allotments for certain types of coverage, often on the most expensive things that people need insurance for the most. The average cost of dental examinations, and even minor procedures, is likely much lower than you’d think. For instance, an average filling (paid in cash) typically costs around 150 dollars, which means your annual dental costs could easily stay under 300 dollars with a single filling and a couple of exams. This same benefit, when covered under insurance, would cost the sum total of your annual premiums plus your deductible plus whatever your portion covered items is. Often times, this number can easily exceed 400 or 500 dollars. Now, before you get outraged and cancel your dental insurance, it is important to note that the more you use the coverage, the higher your return on premium investment will be. On an expensive procedure, such as a thousand-dollar crown placement, you could save 500 (or more) dollars right away, which would immediately cover all but the highest premiums. Most dentists actually prefer to work with those that do not have insurance coverage. After all, if you’re paying cash for your dental services, there aren’t any insurance hoops or coverage criteria concerns to jump through or worry about – for yourself and the dentist’s staff alike. In fact, many dentist offices will gladly offer a discount (often about ten percent) on services that are paid for in cash on the same day they are provided. In this way, the risk of not having dental insurance can pay off for both the patient and dentist alike. Likewise, there are many dental offices that offer a first-time patient discount or other promotions, often for those without dental insurance coverage only. At our Encino dentist’s office, we’ve seen it all; patients that are thrilled to not shell out for dental insurance, those that love employer-provided coverage, and even patients under the Denti-Cal government subsidy program. To each of these patients, we advise the same thing: Analyze your family’s dental coverage situation at least once a year to ensure that you aren’t at risk for overpaying on coverage or care. At Balboa Victory Dental, we just care about your family coming to see the dentist for care regularly, regardless of how you decide to pay for it. We’re more than happy to work with most major insurance providers, should you go that route, but also accept patients everyday that chose to forego dental insurance coverage altogether. Don’t let your family’s dental care fall by the wayside, visit our Encino dentist today!